Hmm… What language is that? Not the tagged data but the second message…? the local code for the second section says it should be “Hindi”.. but it looks like “Hungarian” or “Croatian”.. so I think it should of been “US_hr” or “US_hu”… <——- “looking back at what i just said”…DAMNIT!!! I AM A GEEK… Oh wait.. then I remember how I have a stable job and that Jock from high DON”T! @Elepski: I think the locale code should have been “hi_IN”, which as you said is Hindi. I can’t understand what’s being written though. @Elepski: Alright, now I do believe it is Hindi because I found that “Janam Din ki shubkamnaayein” is “happy birthday”. 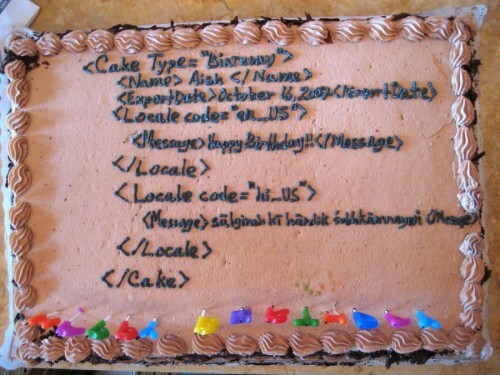 Only the last word is common to the phrase on the cake though.